Comes with AAAHeadsets FREE shipping (SAVES you a further $15). The Plantronics APN-91 Electronic Hook Switch (EHS) module for certain NEC phones enables wireless headset users to place or receive calls without the need to lift your handset. This eliminates the need for a mechanical device such as the Plantronics HL10 Savi handset lifter. The APN-91 NEC EHS supports the NEC DT330, DT730 and DT750 model phones. The Plantronics NEC EHS only works with the following Plantronics wireless headsets: CS510, CS520, CS530, CS540, all Savi 700 series, Savi WO300 & Savi WO350. The only option for earlier model headsets is the HL10 handset lifter. Direct connection to your NEC phone, which eliminates the need for a mechanical handset lifter device. APN-91 Installation Instructions. 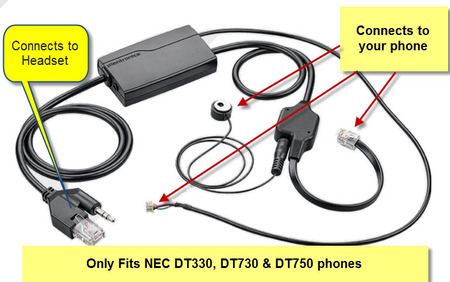 Note: You MUST also get your NEC technician to programme a special headset key to enable this cable to work.